Butte Soil and Water Conservation District, located in Central Idaho in Butte County and the southern portion of Custer County within the Big Lost River and Little Lost River Watersheds. 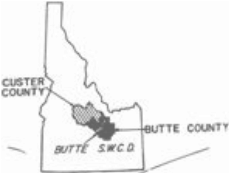 Butte Soil and Water Conservation District was organized by the citizens of Butte County, Idaho in 1953 to offer technical assistance to farmers and ranchers in water use and conservation, land leveling, soil fertility, crop rotation, introduction of new crops, use of windbreaks and range management. In 1967 the portion of Custer County that is situated in the Big and Little Lost River drainages was added to the district. To work with the counties to preserve prime agricultural lands for agricultural use, encourage the restriction of building on flood plains and high water table areas, and to encourage the orderly development of the natural resources through a comprehensive plan. To work with the public land administering agencies in the management of soil, water and related resources of the public lands. To work with federal, state and local agencies in the management of soil, water and related resources of the public lands. To emphasize environmental quality in the conservation decisions made by the board. To encourage all land use decisions to be guided by the multiple use principle. To support sound water resource use decisions.